Announced at Ubisoft’s E3 2017 conference, Skull and Bones is a game that will take players into the Golden Age of Piracy and let them take the helm of their very own pirate ship. When it launches Skull and Bones will be the second of two big pirate titles which were stars at E3 2017 – the first being Rare’s Sea of Thieves. The two, however, are really quite different. While Sea of Thieves is a more cartoonish and whimsical adventure, Skull and Bones leans more towards gritty realism. Created by Ubisoft’s Singapore studio and based on the naval battles of Assassin’s Creed: Black Flag, this is going to be a title for those miss sailing the seas as Edward Kenway. Originally slated for a late 2018 release, Skull and Bones was pushed back to the next fiscal year in May 2018. It was confirmed during Ubisoft's E3 conference that the game will release some time in 2019. E3 2018 brought us a brand new gameplay trailer for Skull and Bones, showing off how things will work in the game's cutthroat hunting grounds. Skull and Bones received two trailers during its E3 2017 debut, one which was cinematic and another which showcased the game’s multiplayer and PvP gameplay. Skull and Bones got some time during the Ubisoft E3 presentation. In this game, we were told, there are no heroes. 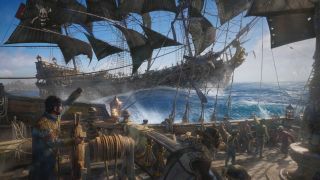 Skull and Bones will take players to the Indian Ocean since piracy is now dead in the Caribbean. Players will target trading ships loaded with coin in a shared open world. It's your aim to collect enough loot and coin that you can become a pirate that no empire can crush and take down. Every player interaction in the world will matter, whether you choose to fight or ally. The reactive and evolving world will apparently change through something called Fortune and you'll need to know the world in order to succeed. Fortunes in the game will reveal changes in factions, weather and trade routes. If there are favorable winds, for example, you'll have more merchants to rob. But that means more competition. It’s been confirmed that Skull and Bones will have both single and multiplayer elements. However, information on what form the single player mode will take is pretty thin on the ground at the moment since Ubisoft concentrated mostly on the multiplayer during its E3 presentation. From the game’s main website we know that it’ll involve starting from the bottom as a wannabe pirate captain with a single ship. From here, you’ll sail the Indian ocean, preying on trade ships, taking down rival pirate captains and avoiding pirate hunters. Successful heists will mean more wealth and reputation. However, power comes at a price and as your reputation and wealth grow you’ll naturally become a target for other pirates. It’s at this point in the game that it might become somewhat dangerous to sail alone and you’ll need to start growing a fleet of ships as well as making and breaking alliances with other pirate captains. Multiplayer will be made up of a few different modes. The one that’s seen the most attention thus far (and the one that we’ve had the chance to play for ourselves) is Loot Hunt. This will pit two teams of five players against one another, with each player in control of their own ship. The aim of the game is to be the team that picks up the most loot, taking down ships on the opposing team if you have to. Winning this section is a poisoned chalice, however, as at the end of the mode, pirate hunters will appear to take down the team that’s managed to get the most loot. The aim of the game will then change and it’ll be up to the team to scarper in a given amount of time. Only those that manage to escape the area in the given time will have their treasure collection counted so it’s important to get your most heavily laden ships out of there for a win, even if it means sacrificing yourself. Voice chat is pretty key in this multiplayer mode, as getting the most treasure will involve splitting up and moving around the map while coordinating your movements. Failure to communicate will make things difficult as we discovered with our own demo team. Inspired by traditional RPGs, Skull and Bones will have different classes of ships and you can choose the one that best suits your playstyle. Players will have access to lots of different kinds of ships across the game and according to an official video from Ubisoft, they will be able to switch between them during the game to take advantage of their varied abilities and strengths. Different ships will offer different tactical advantages, from large but cumbersome frigates, to faster and more maneuverable brigantines, to long-range sloops of war. We imagine the option to switch between ships will only appear once you’ve started putting together a rag-tag fleet, rather than being an option from the off. This has, however, still to be confirmed. It’ll also be possible to customize your ships; Ubisoft has confirmed players will be able to choose their flags, colors and faction emblems. Just as it was for real pirates sailing the seas and for those who played Assassin’s Creed Black Flag, wind will be a key element in Skull and Bones. Players will have to use the wind and positioning to their advantage. The wind can be used either offensively or defensively but it will be a key part of gameplay whether you choose to fight or run away. There are actually a lot of different things that players will have to juggle. As well as controlling weapons, looking at their surroundings and being aware of the direction and speed of the wind, players will be able to climb to their crows nest for a wider field of view. This will of course, draw them out of the action for a while but it will be key to spotting pirate hunters. While players will be able to play with and against one another, everyone will be up against the pirate hunters in some more PvE gameplay. These AI ships will be out to take you down in the name of the powers that be and it’s very tough to take them down on your own. Your best bet with these fleets is to use the wind and escape, or make sure you’ve got the back up needed. "We wanted to create a system that let us tell our narrative month after month, year after year, and then throw in the story elements to it. So, if you're a PVP player, you should still feel like you beat the campaign. If you're a PVE player, or like me, I plan on sailing with my daughter a lot, I want us to be able to go through the story and become kingpins together, and be able to tell the same world narrative through the game ones that we build." It was revealed during an ‘everything you need to know’ video posted by Ubisoft at E3 that Skull and Bones, like Sea of Thieves, will be an online, ongoing service game set in a shared open world. Players will be the star of their own game and it’s expected that they’ll be able to create their own story in this open world. Over time there will be new seasons, new ships, new weapons, new items, new locations and new game modes introduced. We imagine there will also be active and random in-game events, given the end of the cinematic trailer for Skull and Bones teased what appeared to be a Kraken. In an interview with GameSpot not long after the game's reveal in 2017, creative developer Justin Farren wasn't able to offer a confirmation on whether or not loot boxes would appear in the game. Though he said that he had no wish to create a pay-to-win model, Farren did say that in-game purchases for cosmetic and vanity items might appear. This is the most likely route that many games have recently gone down. Is there a Skull and Bones beta? There is a Skull and Bones beta and you can sign up for updates on it on the official website. Simply choose your preferred platform, give them your email address and you'll receive updates as soon as they're announced.